I ordered a few things from Stitching Bits & Bobs last month when we were still in Georgia and it finally arrived. I like SB&B, but they are so slow to ship things out! 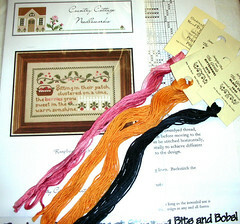 Country Cottage Needlworks "Raspberry Patch" and some threads. 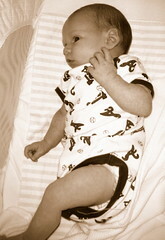 Matthew in his Braves outfit - 4 weeks. Wow, it looks like he is getting bigger already! Matthew looks like he's growing fast! I know how hard it can be to live with your mother. I just got back from visiting mine for about 10 days. Hang in there! Hey, he's awake! :D He looks like such a good boy. I agree with Stitching bits and bobs. I ordered one pattern from them almost 4 weeks ago now and it still has not even shipped. This is the second time I have run into this with them so I think I have reached my limit which is a shame b/c they have such a great site with so many awesome designs. Wow, he looks like he is growing fast and he's so alert! Nice stash. He so beautiful and precious. I hope you do not mind but I added your link to my new stitching blog.